If you like reading what Amanda feeds her kids, you'll love taking a look into what other people—both in the food world and the world at large—prepare for their own children (and occasionally their signifcant others and maybe even their pets). Prepare to be either resentful or appreciative of your own parents. Today: Karen Thornton, who writes about food, family, and history at The Pêche and Chasing Hannah, figures out how to make a lunch for her daughters that can double as a breakfast for herself. I usually wake up with very high expectations. So much will be accomplished! I will exercise, do laundry, and sing and twirl like Maria von Trapp on top of a mountain as I do it. These ideas last about ten minutes. I, like Deb Perelman, really hate packing lunches. My son will buy the school lunch on most days, but my twin daughters go to half-day kindergarten and I have to pack their lunches three days a week. Initially, their lunches were pretty boring: jelly sandwiches and various other lunchy blahs. But then I came across an easy and nutritious dish that my daughters request on a weekly basis. 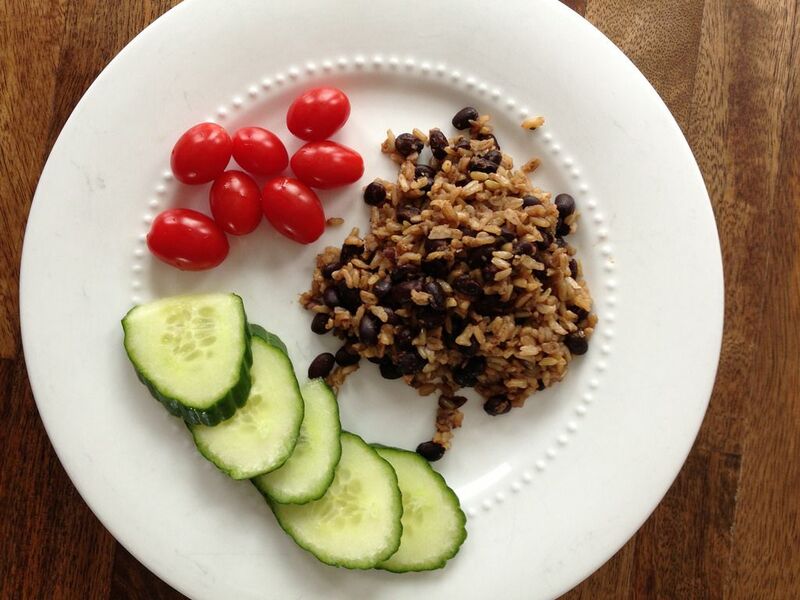 Alice Currah from Savory Sweet Life published a fabulous black bean and brown rice dish in her cookbook. I do the beginning bits of the recipe on the stove, and then I pop it into my large rice cooker. All the work gets done in the rice cooker, and when it's finished, a creamy, savory rice and bean dish is the result. The brown rice does take a while to cook, so I either do it the night before or early in the morning (when I’m still in “The Hills Are Alive” mode). I think there’s something nice about sending along something warm for your kids to eat in the middle of the day. Considering the length of the winter we just pulled through, I like to believe the warm meal brought a little brightness to the gray and cold day. This dish makes quite a bit, and one of the best things is that it makes a fantastic breakfast for me. I fry an egg and place it right on top drizzled with a little Sriracha. And everybody wins. Did your parents pack your lunch? Share with us in the comments below! It's in Alice Curah's book Savory Sweet Life. It's well worth the purchase, I read it cover to cover and have tried several of her recipes. So, how do you make this magical bean and rice dish? Good idea, by the way. I can put you in touch with Karen if you'd like the recipe!